Imagine two people whose paths cross early on in their lives. In the next few years, they meet regularly – not because they are super good friends but because one of them needs the other. All of a sudden, however, their relationship cools down and is on the verge of crumbling irreparably. One of the two then takes the initiative and points out the problems to the other who responds positively. They start helping each other and soon after even build a relationship that brings together elements of friendship and love. 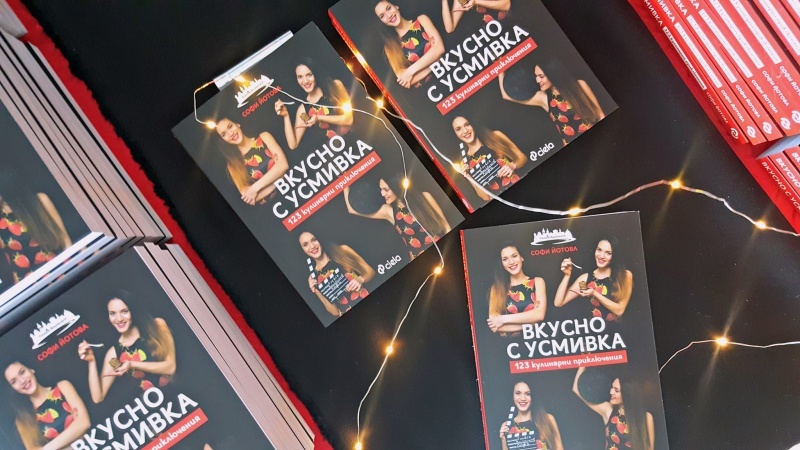 Precisely such a complicated relationship has shaped the life of Sophie Yotova, who graduated from the American University in Bulgaria in 2012 with a double major in journalism and mass communication and business administration. For her, however, this was her relationship with food rather than another human being. Throughout most of her years at school and university, Yotova fought a daily, if not hourly, battle with the food she ate. After going through immeasurable pain, tears, and a burning sense of hopelessness, she made a decision that was going to change her entire life: she committed herself to turning food from her number one enemy into her best friend. The dramatic change took Yotova a lot of time and energy but she now has the indisputable right to see herself as the lord of the food. 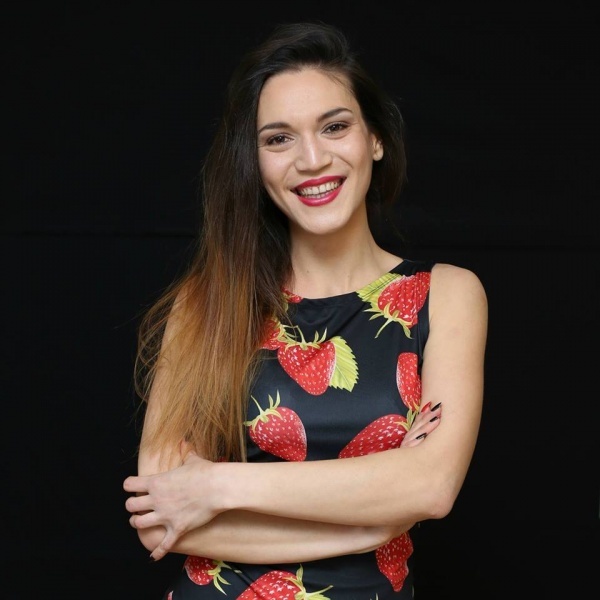 From an insecure girl who struggled with various food disorders for almost a decade and took no interest whatsoever in cooking, Yotova has become one of the most creative and recognizable faces in the Bulgarian online sphere. She is the creator and soul of the culinary blog Foodie Boulevard, the author of the book “Delicious With a Smile: 123 Culinary Adventures,” an organizer of seminar-style culinary workshops, an ambassador of Jamie Oliver’s Food Revolution initiative and an eating psychology coach certified by The Institute for the Psychology of Eating in Colorado, USA. 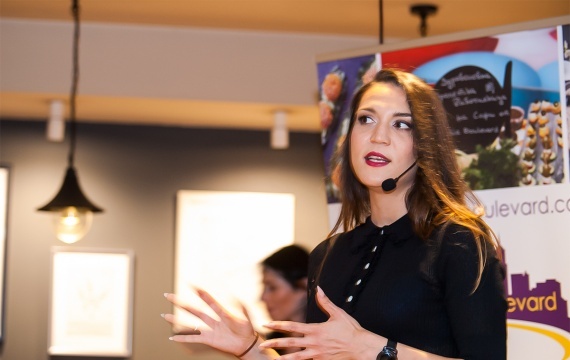 Like any true game-changer carrying the AUBG spirit, Yotova has set herself an ambitious task: to do away with culinary (and other) taboos, myths, and legends, and offer ideas and instruments that help people come up with their own definition of a healthy lifestyle. Yotova only took up cooking a few months after she finished her studies at AUBG and started working in Sofia. Her first steps in the kitchen were “attempts without a concrete direction,” she explains, and had nothing to do with healthy eating. She then saw that her experiments with preparing cream soups were coming out relatively fine, which inspired her to be still more creative. “I am in the habit of selectively creating some discomfort for myself so that I can understand what blocks me and then try until I find a way [to overcome my weaknesses],” Yotova says. Yotova launched her first blog, Sophie’s Bakery, in the summer of 2013. It lasted for two years and didn’t achieve anything big but it was a stepping stone to her breakthrough on the culinary blogging scene with Foodie Boulevard, which Yotova launched in November 2015. Two years later, Foodie Boulevard grew into a full-time job, as well as a source of inspiration, peace and happiness. In other words, the blog became her life. 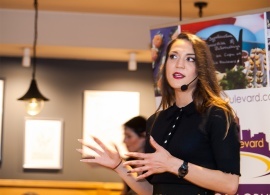 In building her own business around Foodie Boulevard, which currently has more than 26,000 fans on Facebook and 10,000 followers on Instagram, Yotova relies on the entrepreneurial mindset she acquired at AUBG and in the two international companies she worked at after graduation. There is, however, one more reason for Yotova’s success: despite her growing popularity, she continues to see herself as an amateur who knows how to “hack” her imperfections.